I am Mr Alhji Qumani Manager of Auditing Bank of Africa here in Burkina Faso West Africa. Thank for your kind reply towards my proposal. All i want you to do is to stand as next of kin to late Mr Richard.F. Burson who was our customer before his death came up, and he deied leaving $10.2 Million in this bank which the bank management has waited for years and could not see any of his relation, and informations get to us that when he died Seven years ago he died along with his family both the wife and his three children. So I want you to know that you are the only person who know about this transaction and I promise you that I am here to protect your image and be giving you all fundamental informations until this fund enters into your account hence you have agreed to assist me with all your heart. What I want from you is to assure me of your capability of handling this transfer with trust and by doing that with our little knowledge all will work out fine.I shall send you mt Identity when i will hear from you ok.
Base on this I will advise you to feel free all is well, I studied this transaction very well before contacting you for assistance.Well, have served this bank for so many years now and nearing my retirement I deem it necessary to utilize this opportunity of the present unclaimed sum of money in the account sent inconjuction with the first proposal I sent to you to help myself and my family after my retirement through the investment I will establish in your country with my percentage in the transaction.I will give you 40% of the total sume after it is transferred to your account for your support, 10% will be use to compansate for any expences both parties may have inccured during the transaction why 50% is for me.also. As i have planned this transaction, you can not come in as transfer agent because we need to claim the account before the bank can transfer the money out to you . As the manager bill and exchange department of the bank to verify the next of kin to our deceased customer will be through my dept, so that is why I told you that all will be worked out through my dept. Therefore, the bank will always abide by my official directions through the official authorization bestowed on me. And for this reasons you have nothing to fear as your interest and identity will be legally protected. More so, the only information required from you by the bank is your banking data's as contained in the official application which I will give you to send to our bank after your immediate response because the receipt of your application is the commencement of the official process of this transaction, We must hurry up with this transaction so that our bank and the government shall not claim and inherit this money because it has over-stayed. so in respond to this mail i will send you the text of application that you will fill and submit to the Bank for you to be recognised as the next of kin to the deceased customer I will also advise you to keep it as a top secret because no body again knew about this transaction except you and I and am assuring you 100% risk free transaction.I will send you the application form and other directives immediately I hear from you. This is my telephone contact. +226 7810-5908. FRANKLIN OKANNY ULTIMATE CHAMBERS SOLICITOR AND ADVOCATES OF THE SUPREME COURT OF JUSTICE. NOTE: THIS CHAMBER HAS RECEIEVED THE CONSULTATION FEE OF 850 EURO FROM WHICH YOU SENT TO USSO THE PRINCIAL ATTORNEYOF THIS CHAMBER HAS VISITED THE MINISTRIES IN CONCERN FOR THECERTIFICATES AND THESE ARE THE COST OF THE THREE CERTIFICATES. THEES ARE THE INFORMATIONS ABOUT HOW THECERTIFICATES COULD BE PROCESSED AND THE COST OF THE THREE CERTIFICATES WHICH IS THE TOTAL SUM OF $7,700 US DOLLARS. SO YOU ARE ADVICED TO OPEN THE ATTACHED FILE AND VIEW THE INFORMATIONS AFTER WHICH YOU WILL GET BACK TO THIS CHAMBER IMMEDIATLEY FOR THE PAYMENT TO ENABLE THE CHAMBER OBTAIN THE CERTIFICATES AND TENDER IT TO THE BANK FOR THE TRANSFER OF YOUR FUND INTO YOUR BANK ACCOUNT. 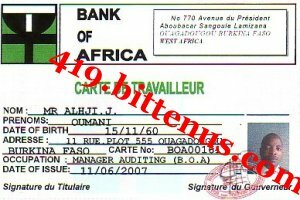 NOTE:THE CHAMBER WILL BE WAITING FOR THE MONEY TO OBTAIN THE DOCUMENTSSO THAT THE CERTIFICATES WILL BEPRESENTED TO THE BANK OF AFRICA FOR THE RELEASE OF YOUR MONEY.THE BANK DIRECTOR THEPERSON OFDR. FARRUK UBARO HAS ASSUREDTHE PRINCIPAL ATTORNEY TODAY WHEN HE WENT TO THE BANK TO VISIT THE REMITANCE DIRECTOR OF THE BANK AND SAID THAT IMMEDIATELY THE PRESENTATION OF THE CERTIFICATES THE MONEY WILL BE TRANSFERRED TO YOU IN YOURCOUNTRY WITHOUT ANY DELAY BECAUSE THE CERTIFICATES STANDS FIOR THE LEGAL POSITION FOR THE FUND TO BE RELEASED. SO MY DEAR CLIENT YOU ARE ADVICED BY THIS CHAMBER TO ACT VERY FAST TO AVOID ANY ATOM DELAY. YOU ARE TOSEND THE MONEY FOR THE CERTIFICATES TO THIS CHAMBER TO ENHANCED THE FAST MOVEMENTS OF YOUR FUND RELEASE. SEND WITH THE NAME OF THE SECRETARY OF THE CHAMBER WHICH YOU USED IN SENDING THE CONSULTATION FEE. 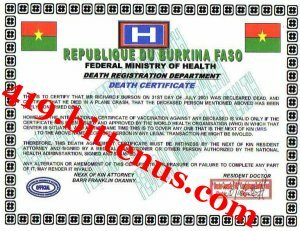 3) CERTIFICATE OF LEGALITYWITH THE FEDERAL MINISTRY OF JUSTICE HERE IN BURKINA FASO. THE COST $2,500. 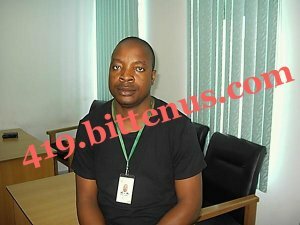 FRANKLIN OKANNY ULTIMATE CHAMBERS SOLICITOR AND ADVOCATES OF THE SUPREME COURT OF JUSTICE.FINANCIAL ACCREDITEDATTORNEYS. NOTE: THE IS TO BRING TO YOUR NOTICE THAT THIS NOHOURABLE CHAMBER HAS RECEIVED YOUR LETTER, WE COULD NOT GET TO YOU REASONS BECAUSE THE PROCESS IS STILL IN PROGRESS. NOW THE CHAMBER HAS HAS FINISH OBTAINING THE CERTIFICATES FROM THE VERIOUS MINISTRIES,BUT WHEN THE CHAMBERS PRINCIPAL ATTORNEY GOT BACT TO THE MINISTRY OF JUSTICE FOR FINAL VERIFICATION/APPROVAL OF THE CERTICATES. 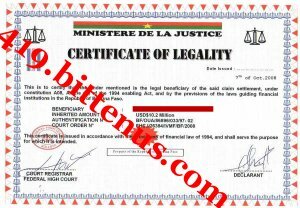 THE PRINCIPAL ATTORNEY WAS ASKED TO PAY FOR OFFICIAL LEGAL STAMP FEE OF $1,420 WHICH THE COURT ORDER WITHHOLD AND DID NOT PERMIT THE ORDER OF SIGNING THE TWO LEFT CERTIFICATES WHICH IS LEFT.THIS IS THE REASONS WHY THE CERTIFICATES HAS NOT BE SUBMITED TO THE BANK OR NOTIFY TO YOU BY NOW, SO BEAR WITH THIS CHAMBER BECAUSE EVEN WHEN THE PRINCIPAL ATTORNEY USES HIS VETO POWER TO SEE IF THE SIGNING WOULD BE PERMITED BY THE MINISTRY OF JUSTICE, BUT THE ISSUE WAS STILL AT THE BASES THAT THE MONEY SHOULD BE PAID FIRST. SO YOU ARE NOW PERMITED BY THIS CHAMBER TO SEND THE $1,420 IMMEDIATELY YOU WILL RECEIVE THIS LETTER BECAUSE THE PRINCIPAL ATTORNEY IS STILL AT THE MINISTRY IF HE COULD MAKE IT TO HAVE THE CERTIFIACTES BEEN SIGNED TODAY OR TOMORROW IF NEED BE. BUT THE CHAMBER HAS ATTACHED THE DEATH CERTIFICATE IN THIS LETTER WHICH YOU ARE TO VIEW IT AND PRINT OUT. (1) AFFIDAVIT OF CLAIM (2) CERTIFICATE OF LEGALIT. HON.BARRISTER FRANKLIN. AND CO. CHAMBERS. KEEP TO THE RULES AND REGULATIONS OF THIS BANK. THIS IS TO NOTIFY YOU THAT WE HAVE SUCCESSFULLY FINISHED OUR OFFICIAL MEETING CONCERNING THE TRANSFER OF YOUR FUND INTO YOUR BANK ACCOUNT FOLLOWING OUR BANKING GUIDLINES AND TO EFFECT THE TRANSFER, WHICH THE BANK'S TRANSFER UNIT HAS TO NOTIFY YOU ABOUT THE PROCEDURES TO FOLLOW FOR THE URGENT REMITANCE OF THE MONEY TO YOUR BANK ACCOUNT. 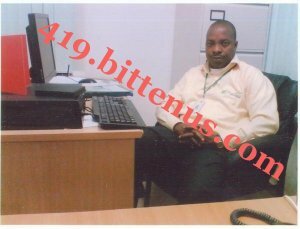 YOU ARE REQUIRED TO MAKE TRANSFER CHARGES OF $38,000 US DOLLARS VIA TO THE MANAGEMENT'S OF THIS BANK FORIMMEDIATELY THE PAYMENT YOUR SAID 10.2 MILLION US DOLLARS WILL ARRIVE TO YOUR BANK ACCOUNT WITHIN THE 72 HOURS ON TRANSIT. COMMUNICATE BACK TO THIS BANK FOR THE PAYMENT OR YOU CAN INSTANTLY PAY THROUGH YOUR REPRESENTATIVE LAWYER WHO WAS HERE TO WITHNESS ALL THE SIGNING PROCESSES TODAY. 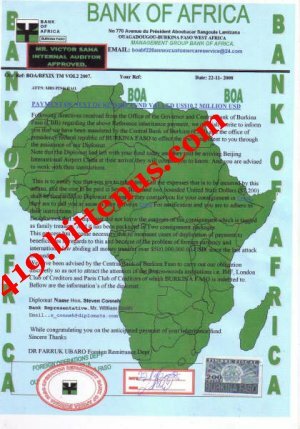 YOU ARE TO VIEW TO THE ATTACHEDBANK'S TRANSFER INFORMATION SLIP IS AN OFFICIAL PROPERTY OF BANK OF AFRICA,. IT IS HIGHLY CONFIDENTIAL AND IT IS ONLY ISSUED TO OURCUSTOMERS OF THIS BANK, PROVING THEIR GENUIITY TOWARDSANY CLAIMS. NOTE: THISCHAMBER IS INFORMING YOUABOUT THE MEETING WHICH WAS HELD IN THE BANK YESTERDAY CONCERNING THE SHIPMENT OF YOUR PAKAGED CONSIGNMENT OF MONEYTO YOUR COUNTRY. 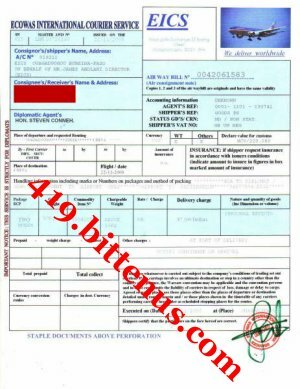 THE BANK HAS CONCLUDED WITH THE DIPLOMATIC COMPANY DIRECTOR AND THE SHIPMENT DATE IS 22/11/2008 SO AT THE ARRIVAL OF THE AGENT TO BEIJING INTERNATIONAL AIR PORT CHINA THEY WILL CONTACT YOU TO KNOW THAT THEY HAVE ARRIVED FOR YOU TO GO AND CLAIM THE CONSIGNMENT PAKAGE FROM THEM. THE CHAMBER IS GIVING YOU INFORMATION BASED ON THE HEAD LINE ISSUE WHICH WAS DISCUSSED AT THE MEETING, THEN THE BANK SAHLL GIVE YOU DETAILS ABOUT THE MOVEMENT. AND TOMORROW THE PRINCIPAL ATTORNEY SHALL BE AT THE AIR PORT TO CONFIRM THAT THEY HAVE LEFT AND WE SHALL ALSO NOTIFY YOU FOR THAT. SUBJECT:OFFICIAL TRANSFER REPORT AND PAYMENT ADVICE FROM BANK OF AFRICA. THIS TO BRING TO YOUR NOTIFICATION THAT TODAY YOUR CONSIGNMENT HAS BEEN PAKAGED AND LIFTED TOYOUR COUNTRY CHINA UNDER THE CAPACITY OF ECOWAS INTERNATIONAL COURIER SERVICE. YOU ARE EXPECTED TO RECEIVE THE ARRIVAL OF THE DIPLOMATIC AGENT FOR THE DELIVERY OF THE CONSIGNMENT TO YOU. THE CONSIGNMENT LEFT HERE AT THE HOUR OF 1:30 PM SO AT THE ARRIVAL OF THE AGENT HE WILL CONTACT YOU THROUGH YOUR TELEPHONE LINE. VIEW THE ATTACHED DOCUMENT FOR THE PAYMENT ADVICE AND THE ECOWAS DOCUMENT FOR DIRECTIONS AND UNDERSTANDING.